Dr. Vinay Duddalwar is a renowned radiologist in Los Angeles, California. He received his medical diploma from Government Medical College and Hospital University of Nagpur, India in 1990. After getting his medical degree, he did an internship at the Government Medical College, between 1988 – 1990. Dr. Duddalwar completed his medical education with a residency in radiology at Sassoon General Hospital, between 1991 – 1993 and a fellowship in abdominal imaging & intervention at the University of British Columbia, between 1995 and 2001. He is certified by the American Board in diagnostic radiology. His subspecialties are general radiology, abdominal imaging, gastrointestinal imaging and genitourinary imaging. 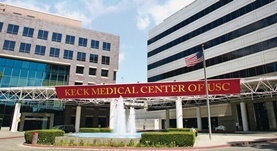 This doctor works at Keck Medical Center of USC and at USC Norris Comprehensive Cancer Center and Hospital. He was awarded the honor Super Doc and the following certifications: D.N.B. Diplomate of the National Board (Radiodiagnosis) The National Board of Exams, New Delhi in India, MD , University of Pune in India, M.Rad. Masters in Radiodiagnosis, University of Aberdeen, U.K. and FRCR, Royal College of Radiologists, U.K.. He was also voted a Top Doctor by Pasadena Magazine in 2011. He has published a lot of articles in cooperation with other doctors. He is a member of the medical organizations: American Roentgen Ray Society, Royal College of Radiology, UK and Los Angeles Radiological Society. Dr. Vinay Duddalwar has contributed to 3 publications. Incisional and Parastomal Hernia Following Radical Cystectomy and Urinary Diversion: The USC Experience. Movassaghi, K.,Shah, S. H.,Cai, J.,Miranda, G.,Fernandez, J.,Duddalwar, V.,Daneshmand, S.,Djaladat, H.; J. Urol.. 1900 Jan 01. Bernhard, J. C.,Isotani, S.,Matsugasumi, T.,Duddalwar, V.,Hung, A. J.,Suer, E.,Baco, E.,Satkunasivam, R.,Djaladat, H.,Metcalfe, C.,Hu, B.,Wong, K.,Park, D.,Nguyen, M.,...; World J Urol. 2015 Jul 15. Quality Improvement With Discrete Event Simulation: A Primer for Radiologists. Booker, M. T.,O'Connell, R. J.,Desai, B.,Duddalwar, V. A.; J Am Coll Radiol. 1900 Jan 01.